My friend, Andrea Johnson, told me about James and Evelyn Wragg. I did not realize they had been married for 63 years and going on 64 years in November. When I got there, I recognized them from the Trinity Lutheran Church in Maryville. 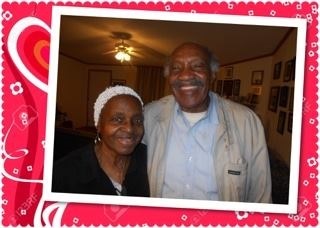 James is 86 and Evelyn is 82 in April. “We’ve known each for most of our lives,” she said with a laugh. Although, they are both from Georgetown, they met in New York where they ended up living for about fifty years before returning. “It was time to come home,” James said of the move back to Georgetown. “What kind of work did you do in New York?” I asked as one of my first questions. “What is a porter?” I asked as I jotted some notes down. Evelyn leaned over and answered, “He was a janitor, but they are called ‘porters’ in New York. Being a janitor is a very lucrative job. When I was a young girl, I overheard the adults talking. My father’s friend was a janitor and made excellent money. I remember thinking that if I couldn’t be a nurse or a writer, I would be a janitor at my school. “So before you retired and moved back to Georgetown, how did the two of you meet?” I asked. “Yes, he was. And then when I came back to Georgetown so I could finish my school and graduate, he wrote me love letters...the whole time,” she said of their courtship. “James,” I said laughingly, “You are a flirt.” He agreed. They are so easygoing and so easy to visit with. I hated to leave them, but I knew our time was growing shorter, so I dashed into the next part of the interview. “Who knew first that you wanted to marry the other?” I asked. “He did,” Evelyn answered without hesitation. “She had a three-story brownstone so, we married in the living room and then had the reception downstairs in the basement,” Evelyn added. James nodded in agreement with his wife’s answer. I loved how these two were on the same wavelength with one another. This is certainly an unusual couple. I’ve said a few times about one being the storyteller or comedian and the other the listener. At first, I thought for sure it was James, but now as I’ve closed my notebook, I realize, Evelyn is just as good at telling a story as James. That being said, I’d have to say he’s more the comedian of the two. He certainly cracked me up and sent me home with a smile and occasional laugh over the interview. Thank you James and Evelyn. It was truly a pleasure to have talked with you both. Happy Valentine’s and I wish you many more.